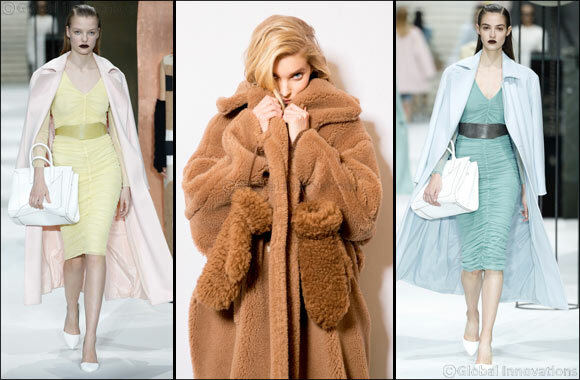 Max Mara: Iconic Coats - Manuela & Teddy. “Manuela” wrap coat with belt in the same fabric. Luxurious, in pure camelhair the Manuela represents the essence of quality and philosophy of Max Mara: to dress all women, with style and finesse, enhancing their personality. colours: camel, black, red and navy. For Pre-Fall 2017 Max Mara also released four new colours: pink, yellow, mint green and light blue. “Every few years we feel the need to present a collection that is just about Max Mara, our brand values and our unique history.” Ian Griffiths Fall 2017 was one of those collections. Max Mara’s creative director Ian Griffiths spent a lot of time in the archive and rediscovered the rich ‘Teddy Bear' coats that the brand made in the 80's using plush long pile fabrics in noble fibres - originally developed in German mills for making high end childrens' toys. He discovered that not only were those fabrics no longer made, but the mills had all closed down and much of the know-how had been lost. The team worked with an Italian supplier to redevelop the technology to produce a unique faux fur of pure camel hair on a base of silk. The exuberant volume of the coat is a celebration of the fabric's opulent extravagance. Everyone who sees it just wants to wrap themselves up in it, including Carine Roitfeld, Kim Kardashian and Rita Ora to name a few.